At the last Sunset Quilters Quilt Guild meeting one of my "regulars" handed me a bag of scraps. Inside were all these lovely triangle pieces. Stop me from myself. I pulled them out and set them beside the machine to sew together as leaders and enders. She had just cut the pieces off so they were not all uniform in size nor did they have a smooth cut edge. I had been sewing some 1 1/2" squares together and making them into little four patchs to set in the middle square of a square in a square block and the light bulb went on. If I made little pinwheel blocks, squared them up to 2 1/2" then I could do the same thing. 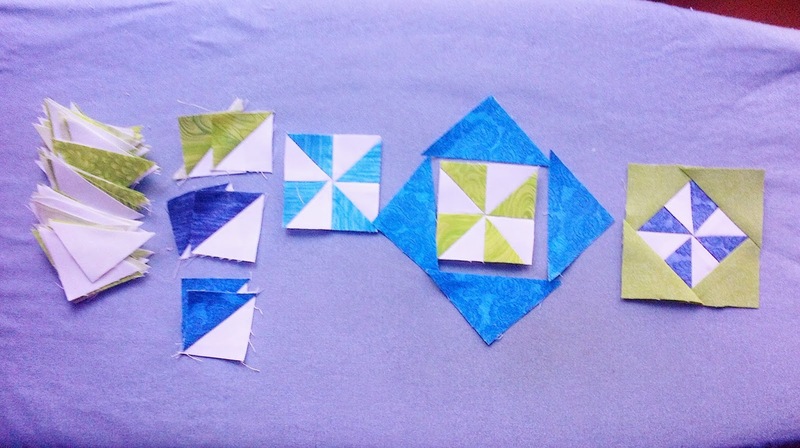 So the sequence above shows the few remaining triangle pieces, a few HST's, One pinwheel block that has been squared to 2 1/2" and then a contrast set of triangles to make a final square in a square block. I will admit I did have the nerve to ask her if she had any strips left that I might be able to use for the outer triangles. I needed 2 2 1/2" squares for each block. She had a couple and I rummaged through my stash. I think I will end up with a nice little quilt out of this exercise. You may have noticed the Hands to Help button on my side bar. The signs ups started last Sunday and continue this week. For we Canadians there is a charity choice on this side of the border. That would certainly help with postal costs and with the uncertainty of sending something across the border. Sarah has a couple of linky parties planned as well as some guest bloggers. If you are at all interested in making charity quilts this is the premier, not to be missed blogging event of the year. I hope you will join me and make a quilt or two or three for someone in need. If you don't want to put a quilt in the mail then look around locally for a Project Linus or similar group. This is a sample of Strip Cocoon I made as a possible class sample. It is Gudrun Erla's pattern called Strip Cocoon. You can use strips or fat quarters. Around here Jelly Rolls are mighty expensive so I dug into my fat quarter stash for some I thought would go together reasonably well and this is what I can up with. You have to then cut the fat quarters into 2 1/2" strips before doing the necessary subcuts. The only tricky part of this pattern is that it calls for partial seams but it is well illustrated and went together nicely. Now we will have to wait and see if anyone would like this as a class. Linking with Cynthia (http://quiltingismorefunthanhousework.blogspot.com) at Oh Scrap! Imitation is the sincerest form of flattery. So I hope that Sharon over at Vrooman's Quilts (here) doesn't mind if I imitate her and start a new Leaders and Enders project. I had a small bin of 1 1/2" squares and was really wondering what in the world I would do with them. 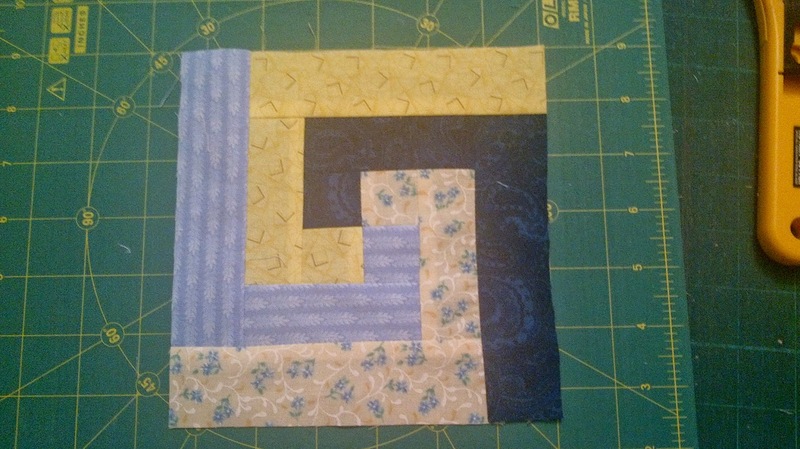 I can use up the 1 1/2" by 2 1/2" pieces nicely but wasn't so sure about these smaller squares. What Sharon has done is make a four patch and then slice two 2 1/2" squares and put the triangles that are formed around the outside edge to make a square in a square idea. So I have started making little four patches. The photo below is a downsized Strip Cocoon block. 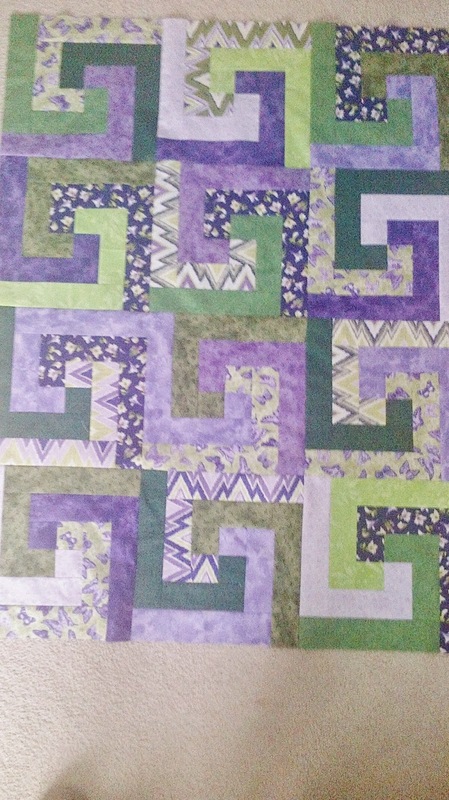 Gudrun Erla of gequiltdesigns has written a book where she takes 6 of her patterns that were designed for 2 1/2" strips and downsized the patterns to make them with 1 1/2" strips. Each of the 6 designs has three different sizes. She is working on a new book Stripology II I am guessing the title will be where she is planning to do the same thing with some other patterns. I am currently making a store sample of Strip Cocoon with the 2 1/2" strips and thought I would give a try at the downsized block. Quite easy actually. this particular block makes use of the partial seam. Otherwise it is a very straight forward easy to assemble block. 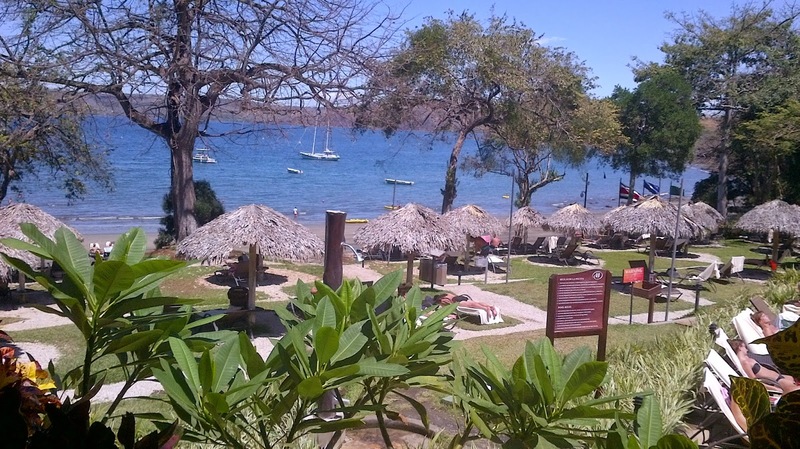 Two photos to remind me of our wonderful vacation in Costa Rica. 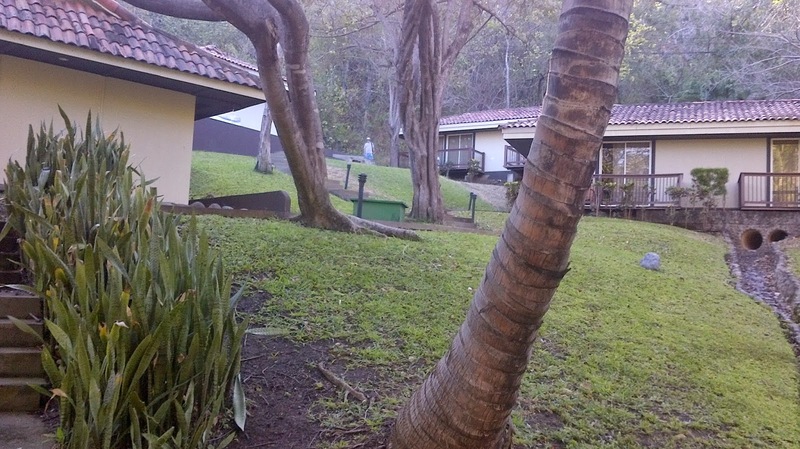 In the top photo the tiny spot at the top of the stairs (path) is Bill beside our unit. We had to climb these steps each and every time we went anywhere. Xavier counted them and told me there were 39. I was too busy climbing them to count. The bottom photo is the view from the bar. I don't do direct sun so I was often found in the bar at a table with a good book (or some mediocre books). We got away for two weeks. The whole family was there for week one. That was the busy week. Week two it was just the two of us and it was very relaxing.